In 1960 a couple of guys from Vágur decided to buy the old Havnabáturin, a boat used for tradional rowing compitions in the summer months, and use it as an whaling boat. The boat was bought for a prize of 1.200 kr. and the old owner, Havnar Róðrarfelag, demanded that the boat should only be used a whaling boat and could not participate in any rowing compitions. The new owners were: Mortan á Báraldarbakka, Andrias í Kykslið, Einar í Kykslið, Kalurin við Misá, Aksal í Garðinum, Niels Pauli á Gaddi, Torben inni á Bakka, Torbjørn hjá Manna í Líð, Sverri hjá Kissa, Pól hjá Pól Sofusi and Poli hjá Kristini. The old Havnabáturin, a 10 oar boat, was used in whale hunting for some years. But in every hunt, the boat was damaged. The boat was built to use in rowing compititions and the boat planks were thin. If a whale hit the boat, the planks were damaged. In the end the boat was severly damaged and was not repaired. The owners decided to build a new boat and asked Sofus Hammer to build a new whaling boat, an 8 oar boat, instead of the 10 oar boat they had. This boat was build in 1971. And the owners wanted the boat to be built with inspiration from the design and size of the boat Hvalurin (the Whale), which had not been damage in any whale hunt. The new boat was named Dýrið, in english “The Animal”. 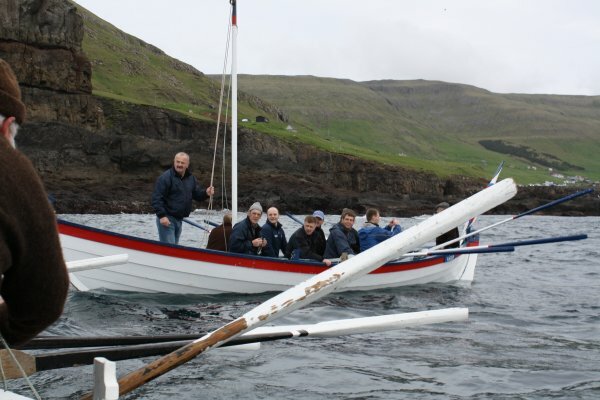 Dýrið is probably the last boat in the Faroe Islands built as a whale hunting boat.